As book bloggers, sometimes we get so caught up reading review titles and new releases that we end up missing out on a lot previously published books. As a result, one of my goals this year is to take more time to catch up with my backlist, especially in my personal reading pile. And it seems I’m not the only one. Backlist Burndown is a new meme started by Lisa of Tenacious Reader. Every last Friday of the month, she’ll be posting a review of a backlist book and is inviting anyone interested to do the same. Of course, you can also review backlist books any day you want, as often you want, but be sure to watch for her post at the end of the month to link up! What does a scraggly 1970s punk rocker in New York City have in common with a down-on-luck Hollywood stuntwoman in 2013? In this earthy mind-bending tale that spans time and geography, Robert Brockway takes readers on a strange, scary trip through the dark and twisted underbelly of the paranormal. The Unnoticeables follows three different points of view. In 1977, Carey is a blithe young punk content with simply hanging out with his friends. But life suddenly gets weird. Disturbing rumors of “Tar Men” in the sewers are being whispered around the Manhattan punk scene, and then these strange kids with unnoticeable, forgettable features start cropping up all over the place. All he wants to do is drink and chase girls, but as the threat looms closer and his friends start disappearing or dying, Carey knows the only way to stop the madness is to bring the battle to the monsters. Running in tandem with Carey’s storyline is another that takes place in 2013, which follows a struggling stuntwoman named Kaitlyn trying to make a name for herself in Los Angeles. One night at a Hollywood party, she meets a former teen heartthrob named Marco, who was her childhood celebrity crush back in the day when he was still the star of her favorite family sitcom. But when Kaitlyn finds herself alone with Marco in his car later that night, he turns into an inhuman creature and attacks her. Shaken, Kaitlyn barely escapes with her life, but then finds out that her best friend has gone missing after she was last seen at the same party. The third point of view is much less defined. Interspersed throughout the novel are brief chapters from the perspective of an unidentified character, speaking about their own transformation. The purpose of these chapters will be unclear at first, but as events unfold this person will start providing a lot more context into what’s happening. Furthermore, as connections between Carey and Kaitlyn’s threads start to form, this mystery person will also help us understand and bridge the gap between the present and the past, showing how everything is related. There’s a lot to love about The Unnoticeables. At first, it’s easy to mistake this one as quirky urban fantasy, with its portrayal of Carey and his group of burned out vagabond 70s punk pals, not to mention the bizarre, almost parodic picture of present day Hollywood through Kaitlyn’s eyes. But as the plot moves forward, the narrative ultimately slips into horror territory, becoming progressively darker and grimmer. The novel’s modest page count belies its heavier, more nihilistic themes and it is certainly not all sunshine and unicorns as more and more we are exposed to the increasingly graphic and gruesome violence in both Carey and Kaitlyn’s storylines. And speaking of our protagonists, they were marvelous. I especially enjoyed Kaitlyn and her audacity and spirit. I loved her line about not having too many marketable skills, but hey, if you want to know how to jump out of a moving car going at fifty miles an hour, or need someone to fall down a flight of steps without breaking her neck, be sure to give her a call! Then there’s Carey, bringing a fascinating slice of the 70s youth subculture to life with his full-on Johnny Rotten-type persona. A novel starring a kickass stuntwoman and a punk rocker as its two protagonists? Nope, things don’t get much cooler than that. Carey and Kaitlyn don’t know each other at the start of the book, but of course the best part was finding out how the two of them get together and team up. We alternate between his story and her story, going back and forth between 1977 and 2013, until they meet in Kaitlyn’s time. Carey, now much older, is a vagrant who collects cans in her neighborhood, but his own run-in with the Angels, Tar Men, and the Empty Ones more than thirty years ago makes him a formidable ally for Kaitlyn in her quest to save her friend. I had my doubts about the structure when I first started, but those were dashed as soon as the story picked up, and I saw what the author was trying to do. Let’s face it; so many things could have gone wrong with this format, with the potential to wreak absolute havoc on the story’s overall coherency and pacing, but I was surprised and impressed at how well it worked in the end, with Brockway nailing it without missing a beat. I’m really looking forward to more of his writing. 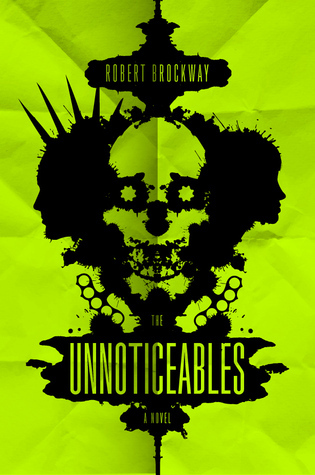 The Unnoticeables is a great start to a new series, and I’m very pleased that I got to read this just in time to dive into the sequel, The Empty Ones. Yeah, I’m looking forward to diving into the sequel. Glad I got caught up! This is on my list! I’ve had a copy of if (thanks to Tammy’s review) and just need to pick it for Backlist Burndown one of these months! I love the sound of this – it’s gone on the wishlist. I really like the sound of this one and how it meshes the Carey and Kaitlyn’s two stories. I’ll have to check it out!